The next step is to define an arbitrary matrix (denoted by A). The size of the matrix determines the size of generated codewords. If m is the size of the identity matrix, and n is the desired length of codewords, then the arbitrary matrix should be of size m-by-(n-m). 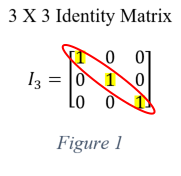 Six digit codewords suffice for the purposes of this article; therefore, the arbitrary matrix must be sized three by three (six-digit length minus three-digit identity). Figure two is A as used by the remaining examples. The only thing left do is combine the two matrices above together to form G. It’s as simple as placing them side by side as shown in figure three. With the generator matrix (G) in hand, generating codewords is trivial. 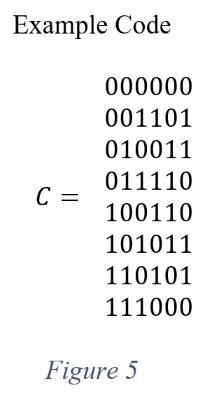 Multiplying any three-digit binary message in row matrix form produces a codeword. For example, the message 011 becomes the codeword 011110 as shown in figure four. Notice the codeword is the original message with three parity bits appended. This happens because the generator matrix begins with an identity matrix. 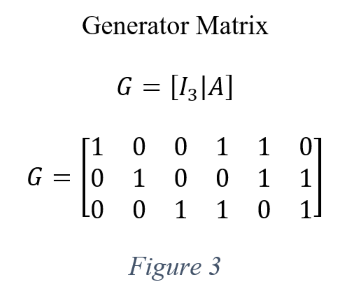 The example code (C) is comprised of every number between 000 and 111 multiplied by the generator matrix as shown in figure 5. The example code has a couple of notable attributes. The first is that the sum of any two codewords is yet another codeword. This is known as a linear code. Another extraordinary characteristic is that the minimum hamming distance of the code is equal to the minimum weight of the nonzero codewords. Weight is the number of ones within a codeword. The reasons for this are beyond the scope of this post; it is mentioned to seduce the reader into continued exploration. Examining the code reveals that the minimum hamming distance is three (d(C) = 3). Another relevant equation introduced in the second installment of this series is the Hamming bound. Recall that the |C| denotes the upper bound number of codewords, n is the length of the codewords, and k is the maximum number of errors the code is capable of correcting. 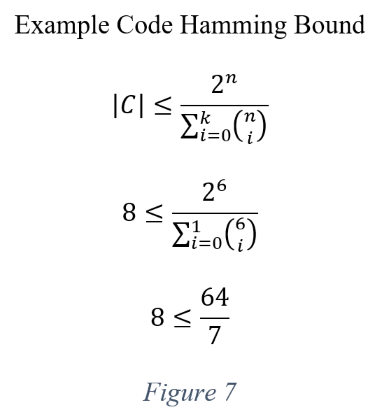 Figure seven demonstrates plugging these variables into the Hamming bound equation. 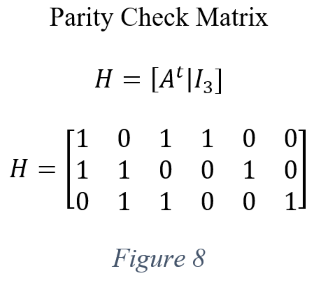 A parity check matrix (denoted as H) is comprised of the transpose of the arbitrary matrix combined with the identity matrix. As a refresher, the transpose of a matrix is simply the matrix flipped across it’s diagonal so that the (i,j)th element in the matrix becomes the (j,i)th element. 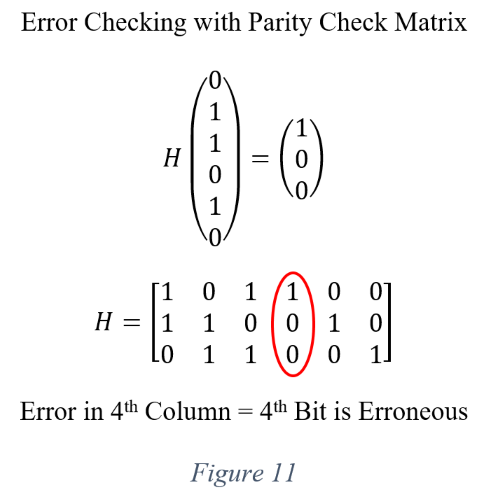 Figure 8 shows the parity check matrix that corresponds to the generator matrix from the running example. Changing any of the bits in the codeword produces a non-zero result which indicates an error. Consider 011010, as shown in figure ten. The result does not equal zero so at least one of the bits is erroneous. 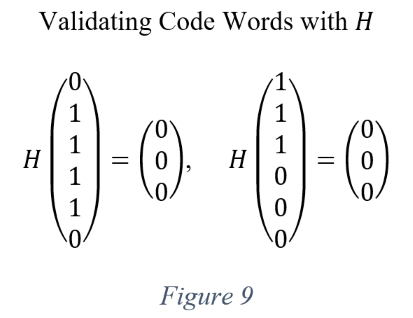 After identifying an inaccurate codeword, it may be possible to correct it using H. Continuing with the example above; the product of the codeword and H is equal to the forth column in H. This indicates an error in the fourth bit and changing the fourth bit produces the correct codeword. See figure eleven for an illustration. Because the example code is only capable of correcting a single error, changing more than one bit generates an irrecoverable codeword. 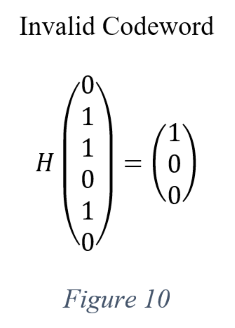 However, with a more complex code, it is possible to correct multiple errors using the distinct sum of H rows and the nearest neighbor method. Again, the reader is encouraged to expand on this with more research.